Super Mario Collector Pins Series 1 - Unboxing and Video Review — GamingWithSwag.com - Dads By Day, Gamers By Night. My lovely wife surprised me this past Christmas with a Nintendo product I had not seen before. Super Mario Collector pins. Apparently this was a product that was released late last fall by PowerA, and distributed to Walmart, GameStop, Target and other retailers. Now besides Target, I personally have not seen these anywhere else in stores. When doing a lookup on GameStop.com, it seems that only select stores are carrying these, not all. Target seemed to have an ample supply, so I decided to pick a couple more up to match the Luigi that I received for Christmas. Retailing for $4.99 each, it is random what pin you will receive, as this is another "blind box/bag" product. As far as I know each pin has equal rarity, with the exception of the elusive Gold Mario pin which you only have a 1-in-48 chance of receiving. 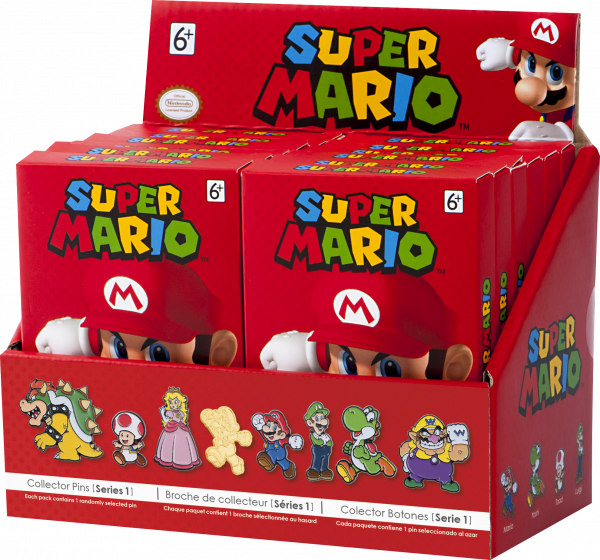 There are 12 pins in every box, which I assume means that there are 4 boxes in a case (48 pins) with only one Gold Mario pin per case. A Gold Mario pin can be picked up for around $55.00 at the time of this posting on eBay if you don't want to hunt for them. The odds of Gold Mario are 1:48. A rare Gold Mario Pin on eBay. 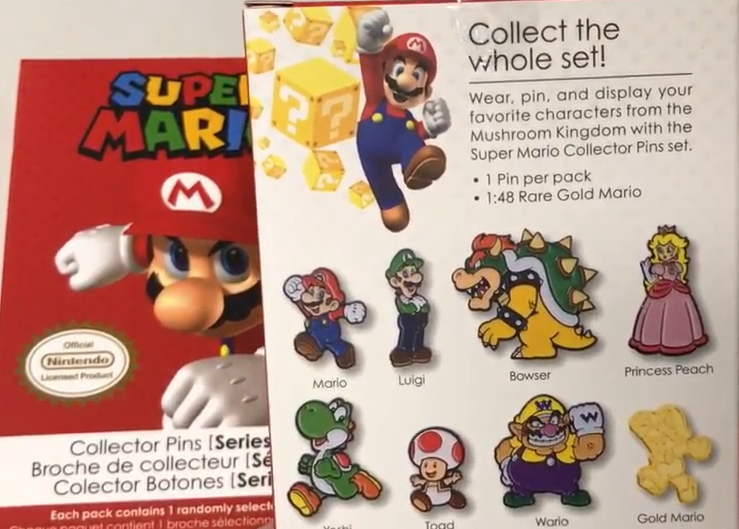 Chris unboxes and reviews the new blind box Super Mario Collector Pins Series 1 from PowerA. What will he get!?!? Gold Mario is a 1 in 48 chance! Licensed by Nintendo. Click to Subscribe ► http://bit.ly/subscribeswag Let me hear your thoughts on what you think of this review video.